The last line of my blog Working with an Editor, Part 2, way back in March, was… Yikes! I’d better get writing. And, in the main, that’s what I’ve been doing. Alongside procrastinating, although not productively; I could have blogged (that’s always a good procrastination technique) but I didn’t. I procrastinated about that as well. This is turning into a confessional, isn’t it? Wouldn’t it be easier just to blog regularly, and save myself having to make lame excuses? Yes, and yes again. But I doubt I’ll change! I should have blogged in July about the fabulous RNA Conference at Queen Mary’s University, London, but by the time I got around to it the moment, as they say, had passed. So many others had already written great blogs on the subject, any contribution of mine would surely be superfluous. And then the revisions on my work in progress came in (see my next blog for more about that!) and the decision was made. But, so that the moment doesn’t quite slip by without at least a nod from me, here is a photo of some friends and me at Saturday night gala dinner, which took place in the stunning Octagon Library. 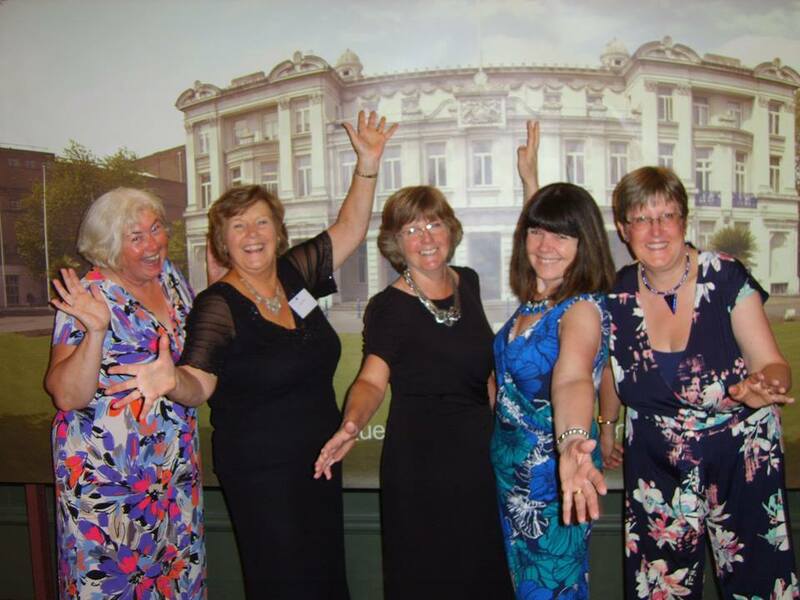 Thanks to Wendy Harris for the ‘Jazz hands’ photo and to Lynn Forth for the photo of the library setting for the dinner. This entry was posted in Romantic Novelists' Association and tagged blogging, conference, Lynn Forth, procrastination, Romantic Novelists’ Association, Wendy Harris. Bookmark the permalink. ← Midsummer Dreams … and nightmares. Oh, how wonderful, and I am impressed how you kept up the pace! So lovely to hear the news of a flourishing author. Congratulations Janice Preston! Thank you so much for your encouragement, Jamal! Always great to hear from you.